Key skills to be acquired: The course has its focus on natural and man-made sediment dynamics in the lagoon, including possible effects coming construction of the nearby submerged Femern Tunnel between Denmark and Germany. Timing: The course will take place in week 26, 2019. It will cover 6 days from Monday 24 June with arrival on Sunday before. The course will conclude on Saturday 29 June 2019 at 13:00. Venue: Danhotel, Havnegade 2, Rødbyhavn, Denmark. (www.danhotel.dk). The accommodation will be shared double rooms. Breakfast, lunch and dinner are included from dinner on Sunday 23 June to lunch on Saturday 29 June. Please let us know if you need special diet. Format: Combination of lectures, hands-on modelling and an excursion in the area. Students work in small groups with a specific project. Groups are supervised by an expert. The course concludes with 30 minutes presentation from each group. More Information: Anders Wedel Nielsen, awn@dhigroup.com, phone +45 4516 9299. Deadline for signing up is 13th of May 2019. Use the online application form to apply for the course. Travel costs up to EUR 400 per person can be reimbursed. Key skills to be acquired: Experimental methods in ice research; model scale tests in ice; measurement techniques; practical experience in testing; data acquisition and basic processing. Background: The internship is initiated as a chance to enhance networking among young researchers and laboratory test facilities within Europe as part of the European Research Project HYDRALAB+. This project has received funding from the European Union's Horizon 2020 research and innovation programme under grant agreement No 654110, HYDRALAB+. Brief outlines of tasks: For a century, the private and independent Hamburg Ship Model Basin HSVA has been at the forefront of hydrodynamic research. 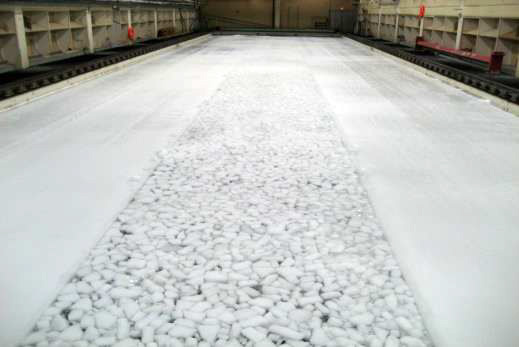 HSVA has been operating ice research facilities since 1972. The main feature is the 78 m long, 10 m wide and 2.5 m deep ice model basin where the performance of ships and structures is assessed through scale testing with models. 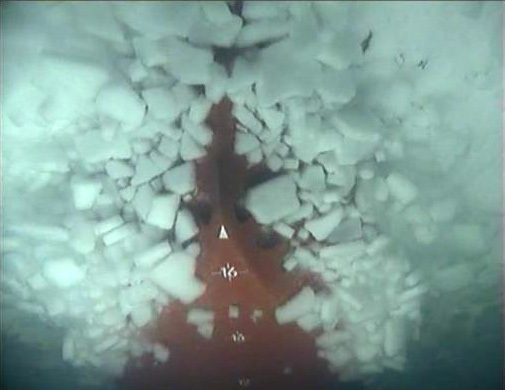 A typical operational case of vessels sailing through broken ice channels is modelled by accumulating small pre-broken ice blocks (so called brash ice) along a track in the basin. The offered internship is related to model scale testing in these conditions. The tasks include: ship model and ice condition preparations, and assisting in the tests by conducting actual measurements and observations. The internship offers a good possibility to obtain a practical experience in conducting model scale testing. Financial support: Travel and accommodation will be provided by HSVA through Hydralab+ funding; working hours and insurance are to be covered by the sending institute (University the intern is employed at). A letter of recommendation will be provided as proof for the interns’ future CV. Connection with Industry. Key skills to be acquired: Experimental methods in hydraulics; scale model tests; sensor calibration; and image analysis. Brief outlines of tasks: HR Wallingford is a world leading research and consultancy organisation that provides specialist advice and support in civil engineering and environmental hydraulics, and in the management of water and the water environment. We have a two-week internship opportunity on the Hydralab+ EU-funded research project. Based at our Oxfordshire, UK headquarters, you will work on projects in our Fast Flow Facility. You will help us to set up and run scaled model experiments and take velocity and laser scanner measurements. This internship will provide you with a good understanding of the experimental methods used in hydraulic engineering and environmental flows. You will acquire key skills in experimental methods in hydraulics; scale model tests; sensor calibration; and image analysis. Key skills to be acquired: Experimentalmethods in hydraulics; scale model tests; sensor calibration; Image analysis; Matlab. Key skills to be acquired: Experimental methods in hydraulics; scale model tests; sensor calibration; Image analysis; Matlab. 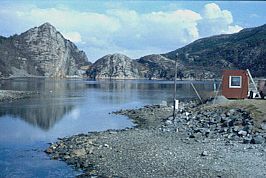 Brief outlines of tasks: You will be involved with setting up an experiment to investigate energy losses in a scaled model of a rock-blasted tunnel. This will include some pressure and Particle Image Velocimetry measurements. There will be a strong focus on sensor testing and calibration as well as image post processing. The main goal of this internship is to gain a good understanding of the experimental methods used in hydraulic engineering and environmental flows.